If only I had known . . . there are so many things that you can do with Peeps that don't require sticking the nasty little beasts in your mouth. For instance, you could craft Peeps dioramas (such as the one shown below). These seem to be quite the rage these days. Even the Washington Post sponsors contests. I'm not sure if there's still time to enter this year's contest, but you can check out the 2007 winners here. "The messy and largely self-entertaining game is played with a microwave oven. One takes two Peeps, and licks the right-hand side of each until sticky. 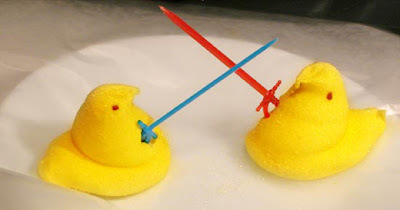 A toothpick is thereby adhered to each Peep, pointing forward like a jousting lance. The Peeps are then set in a microwave, squared off against one another, and heated up. As they expand, the toothpick lances thrust toward each opponent, and the winner is the one that does not pop and deflate (or fizzle and die). Both usually are eaten after the competition, however, regardless who the victor was, calling into question the nature of 'winning' in such a circumstance." Watch a Peeps Jousting video (featuring a very strange squirrel) here. You might also try your hand at answering the eternal question: Are Peeps indestructible? According to one source, even the experts at Emory University in Atlanta found it next to impossible to destroy the creatures. So who's resposible for making these monstrous beasties? Take a visual tour of the Peeps factory here. lol, I used to have a teacher who LOVED Peeps. Everytime at Easter, the students would give her a box Peeps XD THAT KID IS SOO CUTE!!! Marshmallows ARE kind of disgusting. BLEH. 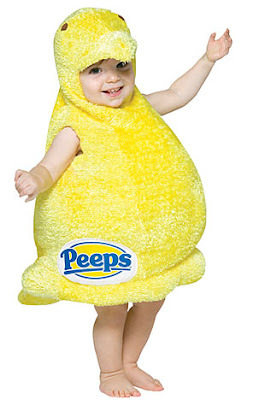 Wouldn't it be embarrassing to be that kid and wear the chick outfit for peeps? Then when he's older everyone would make fun of him. I'm not sure I'd like to eat anything indestructable... but they'd be good material for making something bulletproof! I, personally, think they've gone too far, trying to take over other holidays. There are now jack-o-lanterns, trees, hearts, ghosts, black cats, and gingerbread men, to name a few. But, Happy Spring anyway, right? ... Hey, bullet proof is a good idea! They already make necklaces... but the peeps in them are fake. Why doesn't anyone want to wear stale marshmellows around their neck? i dont like peeps either. there to sweet. ok, i can eat like one or two before i get sick from the sweet, but that one or two doesnt count. Ananka, I Google you and I got something about a writer's festival and there was a Kirsten Miller and thought it was you but then it said dolphin show commentator and from South Africa, so ha ha. Ewww! I hate Peeps, but no matter how many times I tell people that, I get peeps. But NOW I acually WANT peeps. LOL, I'm probly not gonna get any this year. as a fellow blogger... that is sooooo wicked! I like the way the thooth picks go twords each other. Go read my blog at novelgirl-imareader.blogspot.com. I've never tasted Peeps. But in Australia we have this really strange chocolate that's similar, and seems only to appear on Easter. It's semi-melted marshmallow mixed with copious amounts of egg yolk encased in milk chocolate... in the shape of a small bunny. Well, Ananka, you can give all your eggs and marshmallows and Peeps to me! :) Mmmmmmm....s'mores! And I liked the "Peep Show". I think this might be the funniest post on Ananka's Diary I ever read. Hey Kitty! I emailed that to everyone I know! Did you notice how only the sugary coating of the peep burns, but the marshmallow won't? Uck. I find that the only good Peeps are chick Peeps, and all the rest are holiday impersonators. Also, I've blown one up in my microwave before:). Invisible Turtle: I don't know. In fact, my dad'll only eat stale Peeps. another thing you can do is squish them until they get mushy and then have a contest to see who can make them stick to the ceiling the longest by throwing them...haha. I'm not a very big fan of marshmallows either, unless they've been cooked over a fire. And then I only eat the outside; the mushiness sickens me! Of course, Lucky Charms don't count...who ever heard of crunchy marshmallows? huh....i've never heard of those, or eaten any. Then again, i dont celebrate Easter.